Robyn Horn’s steady, diligent execution yields precariously balanced sculptures that seem to defy physics. Published on Monday, March 13, 2017. This article appears in the February/March 2017 issue of American Craft Magazine. 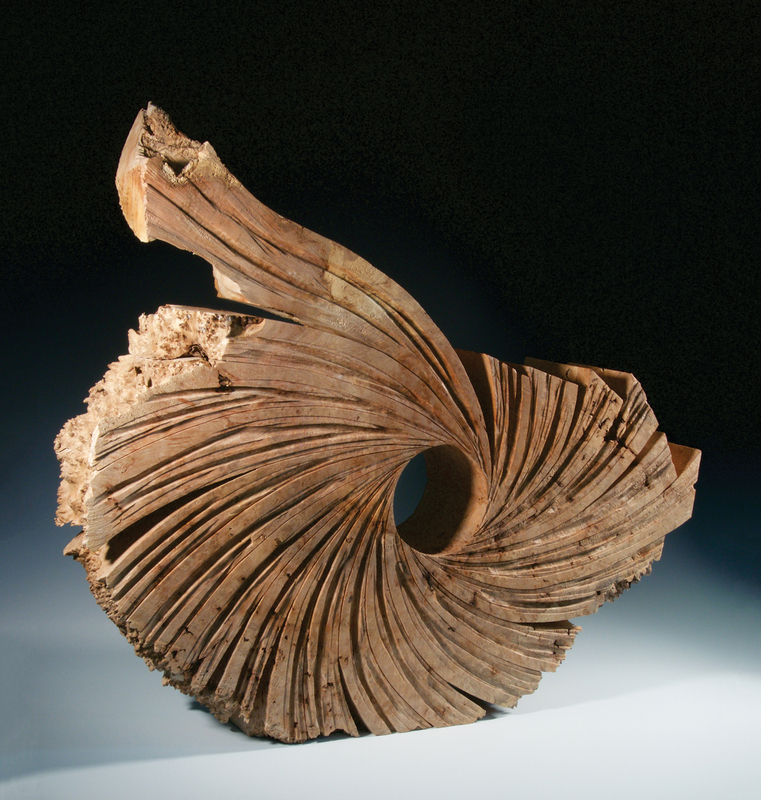 Most of Horn’s sculptures begin with the rough cuts of a chain or band saw, which she later refines using hand tools. Here, she uses a chisel for finish work on a maple Slipping Stone. Robyn Horn has always loved those lyrics from the James Taylor song “Walking Man,” which he recorded in 1974. They even inspired the names of two of her sculptures, Walking Man (1996) and Hypothetical Destination (2003). A one-time singer and guitarist herself, she’s been a fan of Taylor for a long time. Even as they hint at impending chaos, the Slipping Stones radiate beauty and grace, while celebrating the figure and grain of the wood and the iconography of stonework. 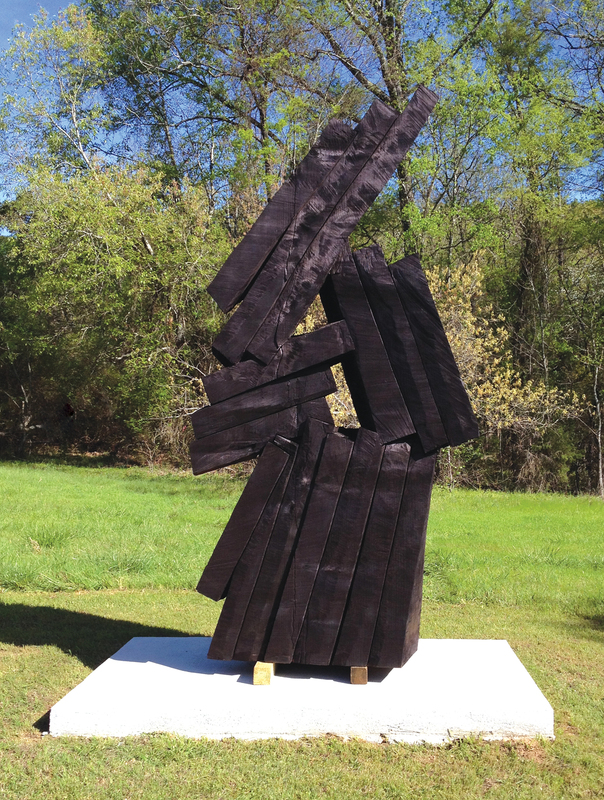 “Tangible vestiges of movement in a ballet” is how David McFadden describes her work in The Sculpture of Robyn Horn, to be published this year by the University of Arkansas Press. The former chief curator at the Museum of Arts and Design, McFadden goes on to discuss her sculptures’ “engaging ‘stop-motion’ quality,” comparing them to the sequential structure of a movie and the famous movement studies by 19th-century photographer Eadweard Muybridge. 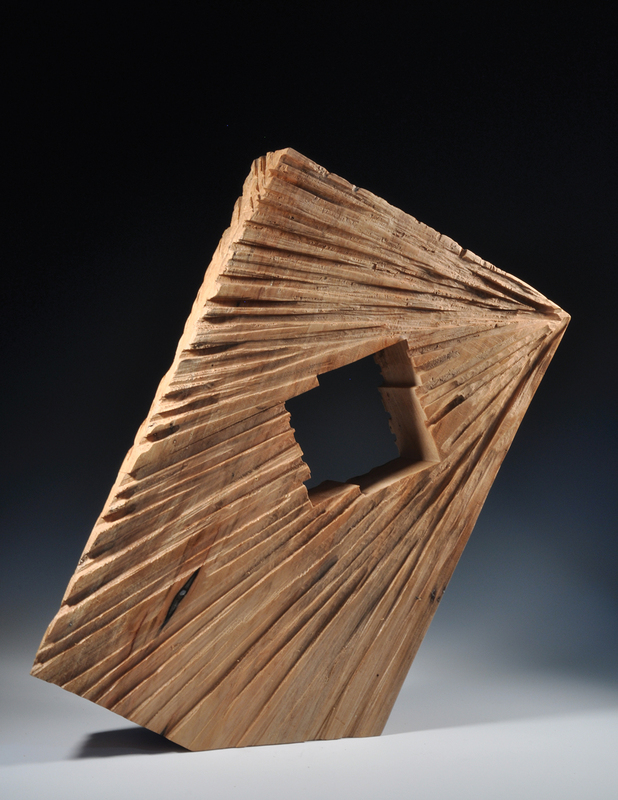 Horn’s works can look animated and precarious because they’re so sturdy and expertly crafted. 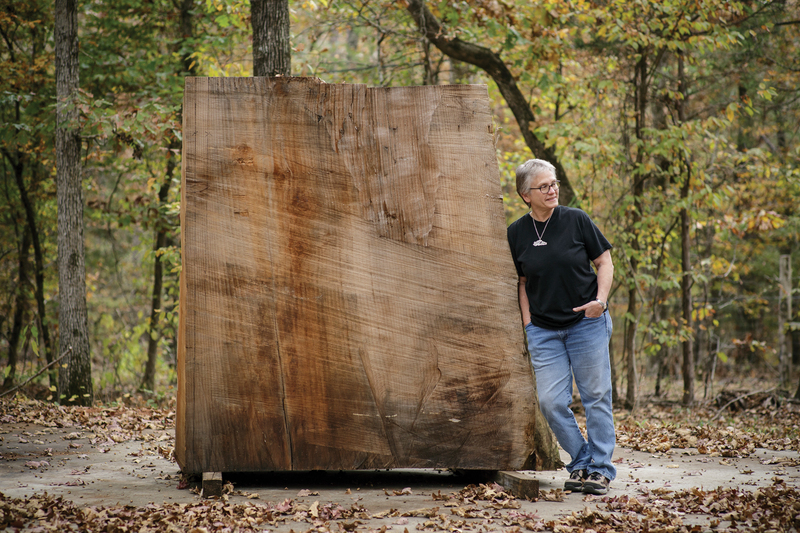 Most begin as a single hunk of wood that she cuts with a chain saw (if it’s a softer species such as redwood, which she uses for her big pieces) or band saw (for hardwoods such as cocobolo), then refines with power and hand tools. Their curves, angles, and textured surfaces can be smooth and subtle, or rough, gnarly, and chunky – again, depending on the properties of the wood. Her genius is making one sculpted whole look like a collection of separate components improbably joined together, layered and overlapping, with artful touches of negative and positive space. She’ll create a brickwork-type arch in which the keystone – the segment at the top that holds the structure together – has slipped and lost its way, so that the other bricks appear about to tumble down. Sometimes she’ll cut a piece out entirely, let it hang in midair or sit on the ground. “It fools the eye, which I enjoy,” she says of the illusory aspect of her work. “People have to look hard to determine if it’s all one piece. They want to believe it’s assembled. I like messing with them a little bit – that’s kind of fun.” The fact is, her designs couldn’t physically hold together any other way. Maybe it’s a metaphor for life: To show weakness, to be open to disruption and change, requires strength and stability. After graduating in 1973, she worked various jobs – she was a photographer for the state parks and tourism department – before marrying her husband, John, a letterpress printer, in 1979. When his brother started turning wood on the lathe in the early ’80s, Horn was intrigued and took up the craft, just in time to become part of a new woodturning movement. She made a name for herself turning round sculptural forms called Geodes, followed by a series of Millstones. “I’ve always enjoyed stones,” she explains, “stone cuts and stone walls, standing stones, stone circles.” By the late ’90s, though, turning no longer satisfied her creatively. On a visit to the home and studio of Barbara Hepworth in England, Horn was captivated by the late sculptor’s monumental outdoor pieces. She had already been sculpting and carving, though not on a large scale. Seeing Hepworth’s work inspired her to pursue that direction, leading to the Standing Stone series and, since 2001, her Slipping Stone series. Horn and her husband live on a large rural property just outside Little Rock, near a state park. “We’ve got a lot of deer hanging out, coyotes and bobcats. That’s part of the joy of being out here in the woods.” There’s a stone circle on the grounds and a line of 10-foot stones heading down a hill. “We had a big party when we were planting these. A bunch of friends came over and helped us, and it was fun,” she says. “I love the way it looks. There’s something figurative about the stones standing there, so massive. It’s wonderful to have them around.” She and John have a big metal building that houses their studios, along with storage space for her wood and the printing presses he collects: “He had one press when we got married. He now has over 200. Moving big, heavy things is something we’ve done together for 30-something years.” For one wedding anniversary, they gave each other a forklift, which she uses to hoist herself up on a pallet and chainsaw her big pieces outdoors. Grounded at home and happy in her studio, Horn finds herself on a roll creatively these days, confident enough with her material and tools that “I can get them to help me do what it is I want to do,” as she puts it. “Sometimes I have a piece designed, and the wood says, ‘Really, you should go in this direction.’ And if you listen, it can help you. You don’t want to let it overpower you, but it’s important to respond to the surprises you find in wood.” She keeps moving toward her hypothetical destination. Nailed, 2016, cherry, nails, 22 x 21 x 3.5 in. Resisting Collapse, the finished slabs look as though they’re frozen in time, right before they topple over. 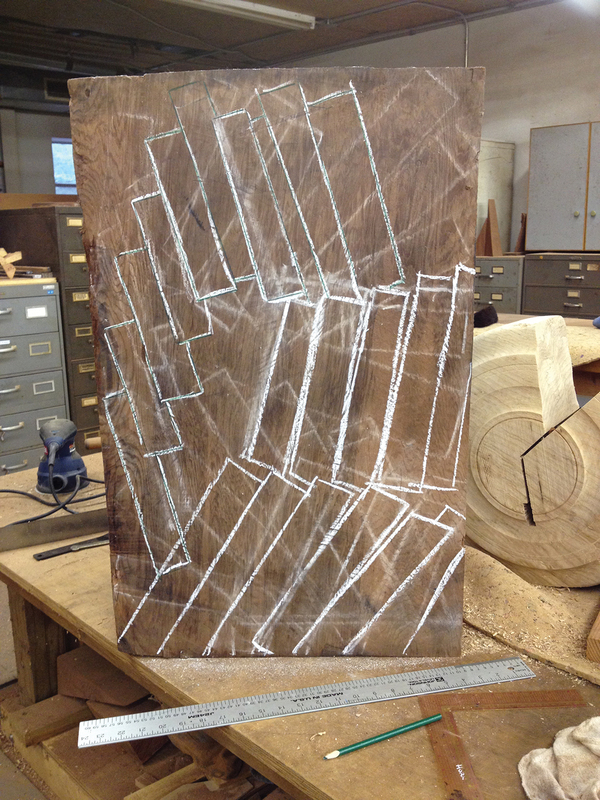 Horn outlined Resisting Collapse (2014), a maquette for a much larger piece, with chalk before carving. The finished slabs look as though they’re frozen in time, right before they topple over. Industrial Series No. 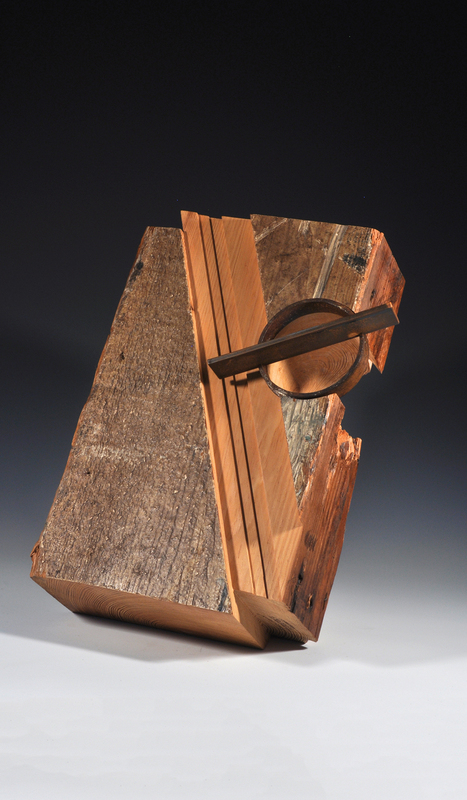 9, Pierced, 2016, pine, steel, 18 x 9 x 12 in. Swirling Rhythm, 2016, maple burl, 31 x 27 x 5.5 in. 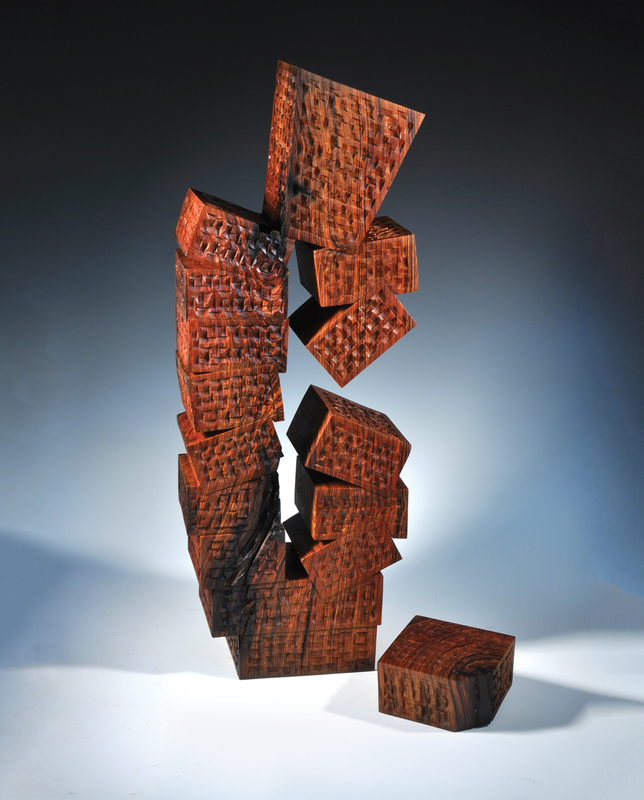 Approaching Collapse, 2016, redwood, black dye, 10 x 5 x 2.8 ft.
Tilted Keystone, One Stone Gone, 2015, cocobolo, 26.5 x 10 x 5 in. 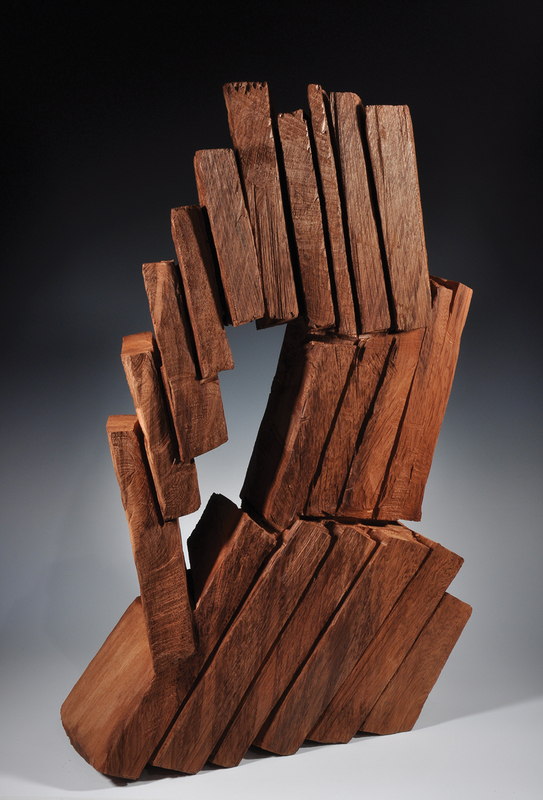 Slip Sliding Away, 2001, rosewood, 33.5 x 11 x 11 in. 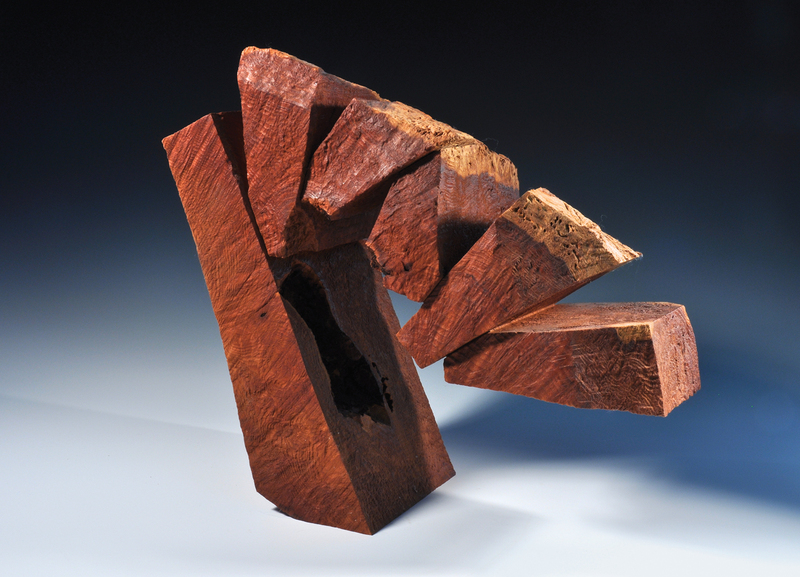 Hypothetical Destination, 2003, redwood burl, 16 x 19 x 8 in. 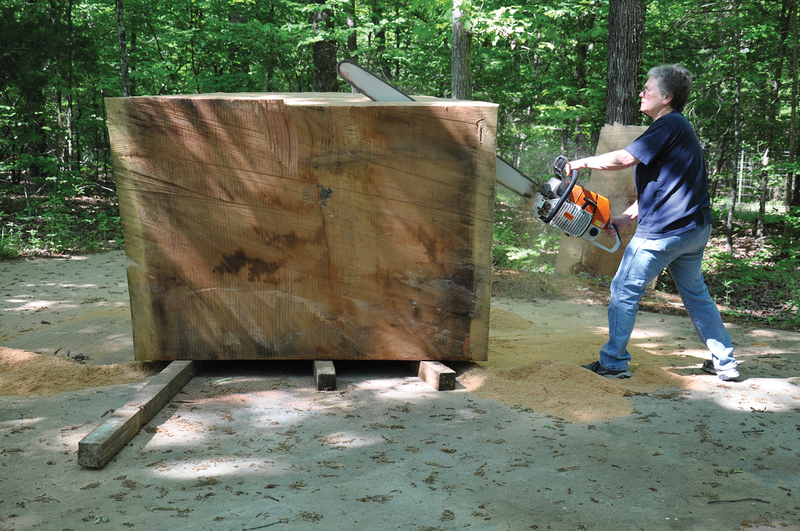 Although Horn began her woodworking career using a lathe, a current tool of choice is the chain saw. 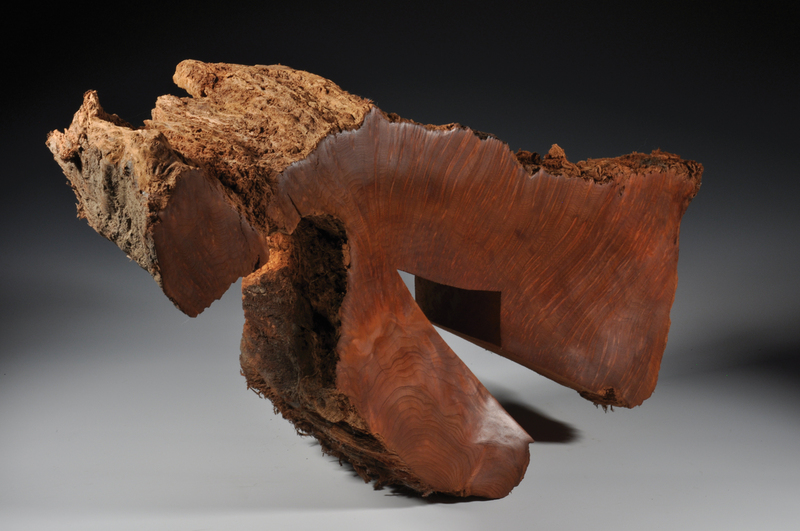 Since the early 1980s, artist Robyn Horn has worked with wood, producing sculptures small, large, and mammoth. She’s pleased when people have to look hard to figure out how she makes her work. “I like messing with them a little bit,” she says. 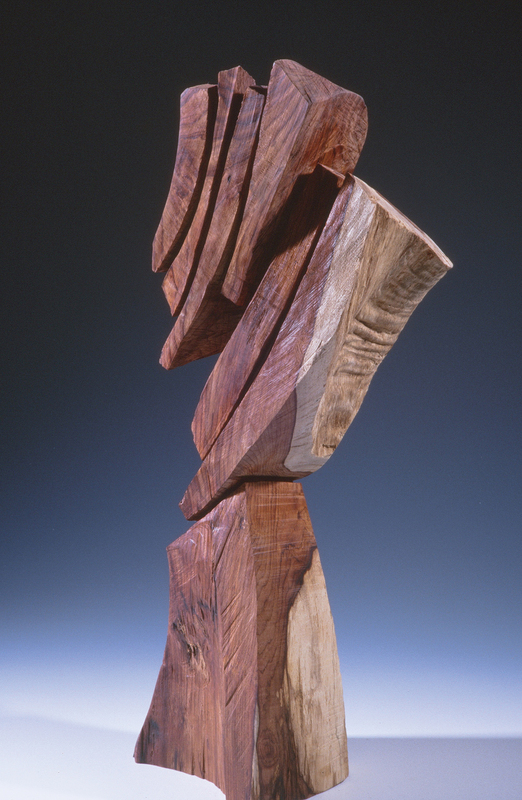 Walking Man, 1996, redwood burl, 16 x 26 x 8 in.